Denmark is often seen as an icon for liberal thought and women's rights, but a move by the Speaker of the parliament sparked controversy Tuesday after she told a fellow MP that her baby was 'unwanted' in the parliament chamber. Danish MP Mette Abildgaard posted on Facebook to highlight her frustration. Abildgaard, a Conservative MP, said that due to an "extraordinary" circumstance, her husband was unable to take care of their 5-month-old daughter Esther Marie during the hour she was scheduled to take part in a parliamentary vote. In her statement on Facebook, Abildgaard maintained that her daughter was quiet as she entered the chamber - content with a pacifier. She also alerted her secretary to take her daughter if she became unsettled. She also noted that she did not ask permission to bring her baby, highlighting that she had seen others bring their children and that normally her colleagues are "pragmatic and make things work". She was then passed a note by the Speaker, Pia Kjaersgaard, asking her to remove her child from the parliament chamber. 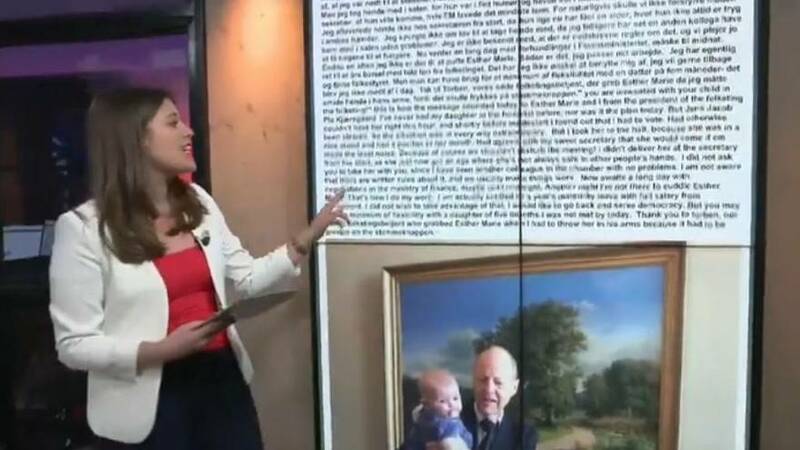 Responding to critics on Twitter, Kjaersgaard said that she asked the secretary of parliament to tell Abildgaard that it "isn't good with babies in the hall". "I thought that was that ... small matters become large in this day and age," the Speaker said. Danish parliament speaker, Pia Kjaersgaard, responded on Twitter. In total, parents are offered 52 weeks paid paternity leave in Denmark. Mothers are entitled to four weeks before birth and 14 following, with both parents allowed to split leave during the next 32 months. Abildgaard highlighted that although she is entitled to a year's leave, paid by the parliament, she chose not to do so. "You can need a minimum of flexibility with a five-month-old daughter. I wasn't met with that today," she said. Ablidgaard's post has ignited yet another discussion about women's rights and paternity leave within the EU, with social media users sharing images of other leaders who have similarly brought their children to work, drawing parallels between Ablidgaard and Italian MEP Licia Ronzulli (seen in post below) who began bringing her child into the European Parliament in 2010. Others mentioned New Zealand's leader Jacinda Ardern's widely reported move to bring her baby to the UN General Assembly in 2018. Euronews reached out to Speaker Pia Kjaersgaard who declined a request to comment.